Find bliss on Beebe Cove at this shorefront vacation rental apartment located along RT 215. This 2-bedroom, 2-bath unit offers a 50-foot veranda, shared dock for swimming and boating, and a 15-foot canoe. Enjoy the waterfront views in a shoreline neighborhood located about 2 miles from downtown, 3 miles from the Mystic Seaport Museum and Aquarium, and more! From stunning sunrises to serene water views, this 1,000-square-foot vacation rental offers a picturesque escape that is sure to make you feel at ease. The floor for rent is that with the eye-catching, L-shaped wraparound porch! The living room and bedrooms feature sleek hardwood floors and sunny walls that brighten the cozy living space. The furniture in these rooms and kitchen boast relaxing color schemes to help make your stay even more serene. Sit back on the sofa and relax with a show playing on the 50" flat-screen cable TV or connect to the wireless internet access and stream through your personal devices. When you wish to dine in, the kitchen is fully equipped and offers plenty of space for your group to gather. Enjoy stunning views through the wall of windows in the kitchen and living room, or step through the sliding glass doors onto the 60-foot shady veranda and fire up the gas grill. This waterfront property features a 50 x 50-foot lush yard and a shared dock. Dip your toes or swim in the water of Beebe Cove, or sit back on the Adirondack chairs and simply enjoy the aquatic views. If you'd like to get out on the water, feel free to use the provided 15-foot canoe! From this charming spot, you're just minutes away from area attractions, restaurants, shops and more. Mostly everything is on or near this road, RT 215. Mystic, the most popular vacation destination in Connecticut, is a town with many faces. One well-known face is Mystic Pizza, which is famous from the Hollywood movie by the same name. This popular pizzeria is located 5 minutes away at the northeast end of RT 215. The downtown of Mystic is under 2 miles away - home to the Mystic Downtown Marina. Also, the Mystic Seaport Museum and Mystic Aquarium are about 2.7 and 3 miles away respectively! The interactive Mystic Seaport Museum is the largest maritime museum in the United States featuring engaging activities, impressive attractions and learning opportunities for all ages. Closer to home you can enjoy quiet walks around Beebe Pond and Beebe Pond Park and fabulous dining at Ford's Lobsters, Abbott's Lobster in the Rough or Costello's Clam Shack. After a day at the sandy beach, head to any of Mystic's fantastic restaurants for a dinner you won't soon forget! The Mystic Market, Abbott's Lobster In the Rough, and Oyster Club all offer something for everyone. Those looking for an upscale meal won't have to venture far! Captain Daniel Packer Inne, and the S&P Oyster Co. are just a few of the fine dining establishments located just minutes from your door. After your dinner, be sure to check out Sift Bake Shop! Sift Bake Shop is a new but world-famous bakery that exists at the intersection with the already famous Mystic Pizzeria, that is, at the point where Rt 215 and West Main St fuse. In 2018, the chef-owner won the $50,000 prize for best pastry offered by the Food Network on TV. If you're feeling lucky, there are several nearby casinos to visit, including Atlantic Beach Casino Resort, Foxwoods Resort Casino, Casino Of The Sky at Mohegan Sun. Located a half-hour drive away, both casinos offer affordable and tasty lunch options. - Amenities include a fully equipped kitchen, 50-inch flat-screen cable TV in living room, free WiFi, 50-foot L-shaped deck, outdoor dining table, outdoor seating, shared dock, 15-foot canoe, guest parking and more. - Serene West Mystic location on the water at Beebe Cove - Ideally situated just minutes away from shops and restaurants and just 2.7 miles from Mystic Seaport Museum! - Very soon a dock ladder will be installed for your swimming convenience and safety (still no diving). The lawn game, corn hole, will be coming soon! The location of this property is superb. Right on the water with lovely views. The sunrises from the verandah were spectacular across Bebee Cove. However the apartment is shabby. Whilst clean, it really needs a lot of decorative attention. The kitchen and bathrooms could do with an update. The kitchen equipment is pretty basic - for example plastic plates and glasses. There was no oven pan, although this was rectified. I would expect better at the rate being charged. Thank you for your feedback. This listing, at 270 Elm Street, Mystic-Noank, is the only vacation-rental house in the coveted Mystic, CT area having sunrises over the River and located within about 2 miles of downtown Mystic. The extraordinary lower apartment for rent in this waterfront house has 4-6 large rooms, a 60-foot roofed-in wrap-around porch and a dock just as long. Indeed, the other summer-rental houses in the coveted Mystic area exhibit excellent antique colonial furnishings as a major part of their strong suit. The furniture and the like at 270 Elm is modern, attractive and functional. 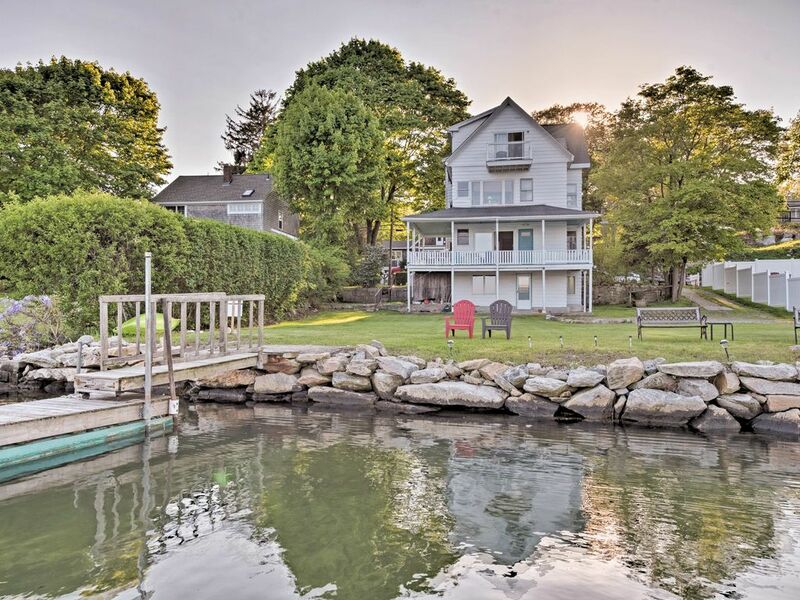 Combining the virtues of each type -- on the one hand, the antique ambiance, on the other hand, waterfront, sunrise, wrap-around porch, proximity to Mystic, etc. -- would lead to an extraordinary leap in demand and -- unfortunately -- in price. We of course are sorry that the listing did not meet all of your expectations. Your feedback will be shared with the homeowner to make improvements in the future. Again, many thanks for your response. Very relaxing place right on the cove and z miles to Mystic...bring bikes and enjoy!!! Fabulous location. Can easily uber to downtown mystic or Noank for under $10 without having to hassle with parking. The house is older with one or two corks but is extremely clean. We used the canoe which fit 2 comfortably to explore Bebe cove.The covered porch area was a great spot to hang and grill dinner. Joe was sure to check in to make sure we had all that we needed. This house is all about being in a great location. Carson’s is fabulous for breakfast. Mystic has great restaurants. Free submarine museum and local golf near by.